For families living on low incomes that include an adult with disabilities, affordable housing can be nearly impossible to find, let alone keep. Many times, families rely on fixed income, essentially living “from crisis to crisis,” according to Sand Point Housing Residential Services Manager Tamara Brown. In 2016, these transitional housing units at Sand Point Housing will be converted into Permanent Supportive Family Housing. 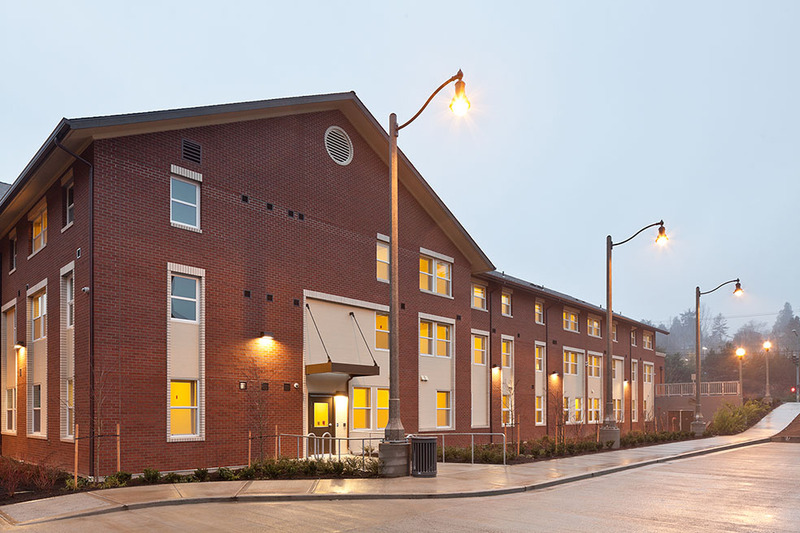 By February 2016, Solid Ground will have converted 26 transitional housing units at our Sand Point Housing campus to Permanent Supportive Housing to help address the needs of chronically homeless families. This conversion is in line with the Housing First strategy, which simply put, provides homes to people experiencing homelessness before addressing any addiction problems, criminal records, or other barriers they may have to accessing affordable housing. Housing First has not only been more effective in terms of keeping people housed, but it is also more cost effective. Solid Ground’s program differs from similar ones by providing homes to chronically homeless families, rather than individuals. 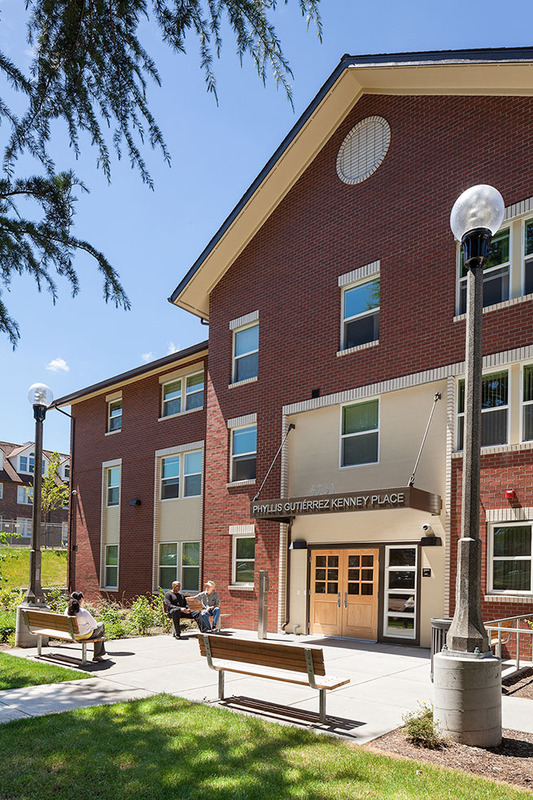 Sand Point’s new Permanent Supportive Housing units will have very low screening requirements, meaning that those with poor credit, substance abuse or mental health conditions, or past eviction, domestic violence or criminal histories will not be denied housing. As a result of the lower screening requirements, family members may require more support and access to services such as financial counseling, therapy and medical attention. In response to this predicted need, a Therapeutic Case Manager, trained to address the needs of the tenants, will offer support to residents, and case management staff will provide 24/7 coverage. Additionally, other Solid Ground programs and community supports will be available to provide a holistic array of services to residents. Before the units open, a lot of work must be completed. Brown explains that families currently in the transitional Sand Point Family transitional housing units will be moving out, though each of them entered the program knowing that it was a 12-month, time-limited transitional program, designed for families to exit to permanent housing as they stabilized. Once these families successfully find housing, the two buildings will be lightly renovated to meet the needs of the incoming families. 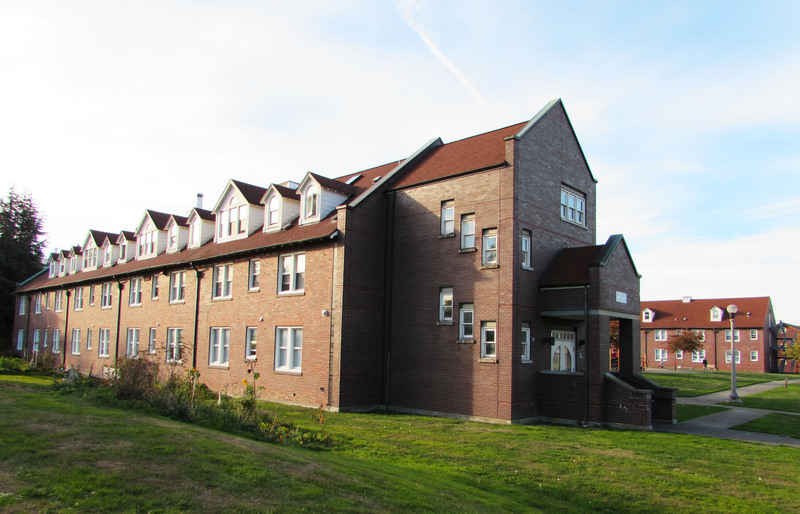 For example, one of the transitional housing units will be converted into a community meeting space, in order to foster a supportive environment and communication between neighbors. Units will be posted on Family Housing Connection in the next couple of weeks, and referrals will be accepted beginning at the end of November. Eleven young artists discovered the Officer’s Club at the Magnuson Park Gallery. This former office of a naval commander became a worksite for young residents of Solid Ground’s Sand Point Housing community. These teens now look out the window to see the fruition of their own leadership – 12 vibrant art panels breathing life back into a decrepit brick building. Eight finished panels installed on one side of the building. The Sand Point Arts and Cultural Exchange (SPACE) has long sought a solution for the slowly deteriorating building across from the gallery. With the City of Seattle investing funds to stabilize it, and future development projects expected, installing art panels on the exterior walls provides an immediate solution for threading cultural value into the building. 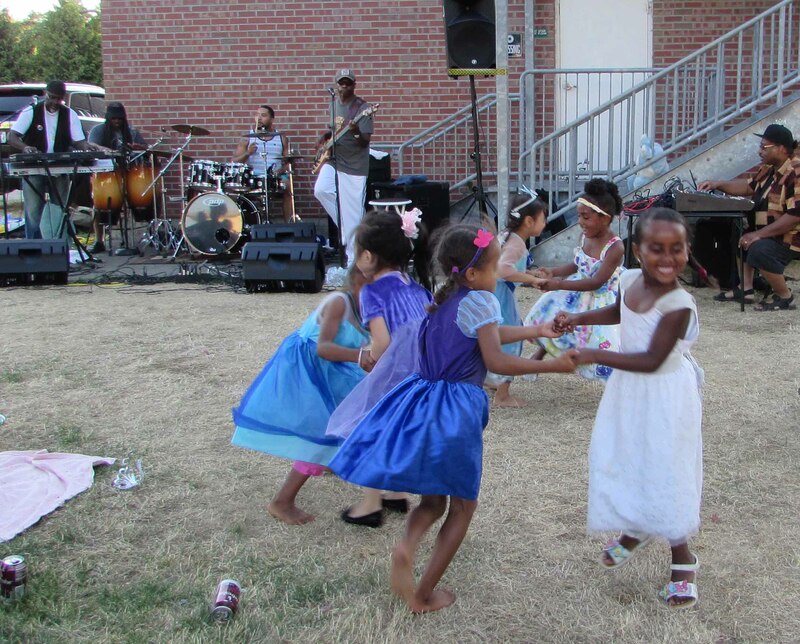 The Department of Neighborhoods’ substantial contribution and the Seattle Parks and Recreation staff and financial help made hiring a contractor and art teacher feasible. The 11 teens infused the spirit of their community into the artwork. Sand Point youth paints the corner of a panel. The teaching artist, Angela Larsen, implemented a process that promised a professional product while staying true to the young artists’ vision and work. The teens began their project by exploring color palettes, and learning how to adjust color shades by mixing paint. They then walked through the park, finding inspiration in plant textures and nature’s own artwork. Angela combined the feedback from the kids, and her own Scandinavian design ethic, and created a design outline that exclusively used three shades of green and three shades of red. In the coming four Saturdays, the young artists put paint to panel and brought the design plan to fruition. As all good work deserves, the young artists will be paid a $150 stipend at a celebratory barbecue in the near future. However, that paycheck does not fully represent the value the panel project provides to the community and the participants. The Executive Director of SPACE, Julianna Ross, observed “how their skills improved from the first session to the last session. They knew how to load the brush, and make the lines… they gained some skills!” She commented on the warranted pride many of the teens felt for the panels. Working so many hours on the panels familiarized the resident teens with the gallery building and other areas they had not known existed. Showcasing their artwork on a main street bridges a comfort gap between the families living in the park and the community park buildings. The young artists look up at the paintings and recognize that it’s their work, that they made it for the community. If you can afford their rate, enlist them in another mural project. Their paint brushes are ready. Thus the title COMPARED TO WHAT? was born for the zine that developed out of a writing and arts workshop series Solid Ground held last fall for the older teens living with their families at Sand Point, a neighborhood of 175 households at the old Naval Station of Puget Sound in Magnuson Park. The workshops were based in the principle that everyone’s voice should be heard. 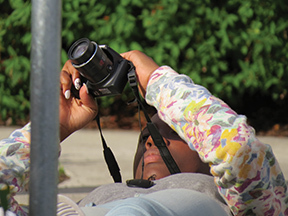 Starting with writing sessions led by Seattle storyteller and educator Kathya Alexander, they continued with photography and design sessions led by Solid Ground staff. Through it all, young people found their voices. “Their growth was beautiful to see,” says Christina Shimizu, Annual Giving Officer at Solid Ground and one of the staff supporters of this youth-driven project. Starting out with writing prompts and progressing to original poems helped the participants feel comfortable, not only with writing, but also with one another. Within this supportive group setting, the youth quickly gained confidence and began to share their personal experiences – an important outlet for previously homeless youth who have not had many opportunities to express themselves creatively. COMPARED TO WHAT? 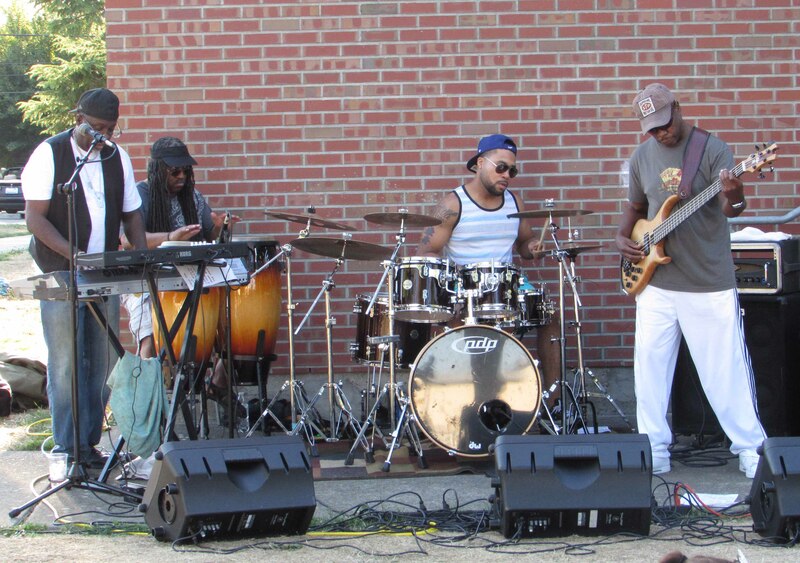 showcases this unique community and amplifies voices that too often go unheard. 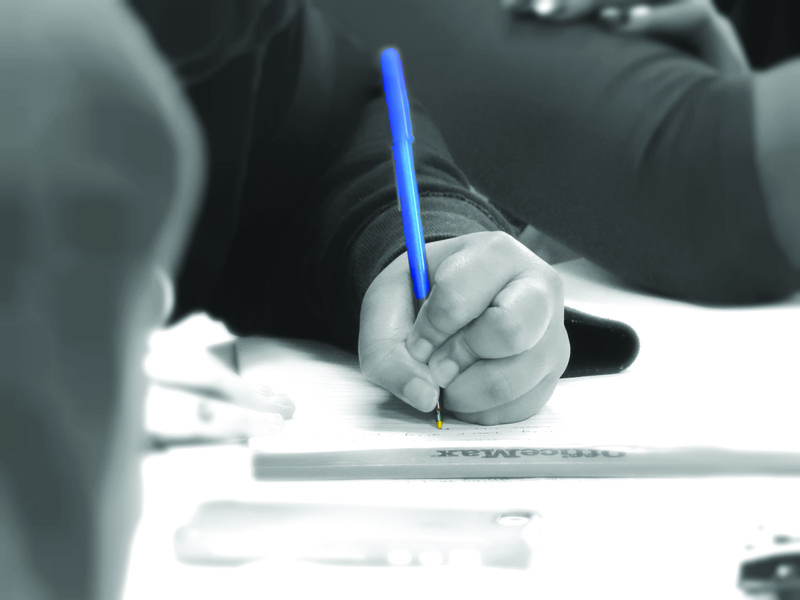 Our published writers & artists are: Ayanle Abdikadir (Abdi), Mohamed Abdikadir, Nya Rambang, Marie, Sahvannah Glenn, Maar Rambang, Heaven, Ryahnna, Geo, Chris Gainey, Ben Dessalegne, Jen Matapula, Andrea R, Deiosha Sparks. 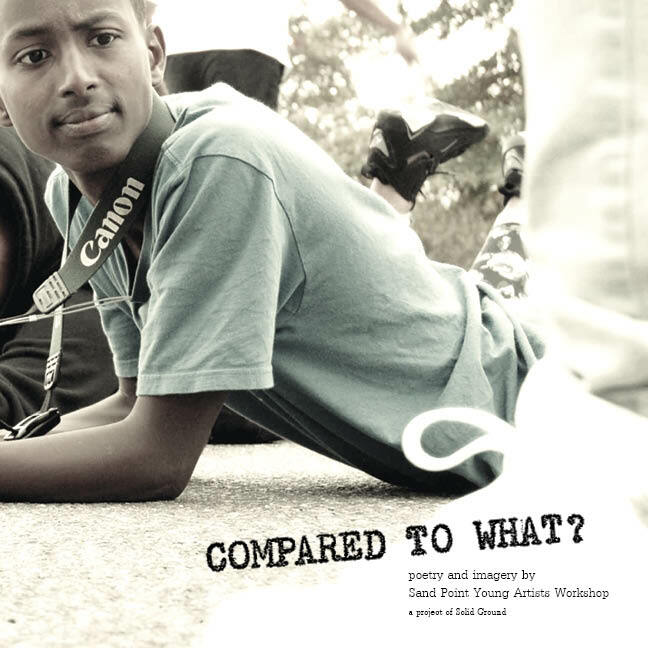 To get your copy of Compared to What? or learn more about how you can support the youth at Sand Point Housing, contact Christina Shimizu at christinas@solid-ground.org. 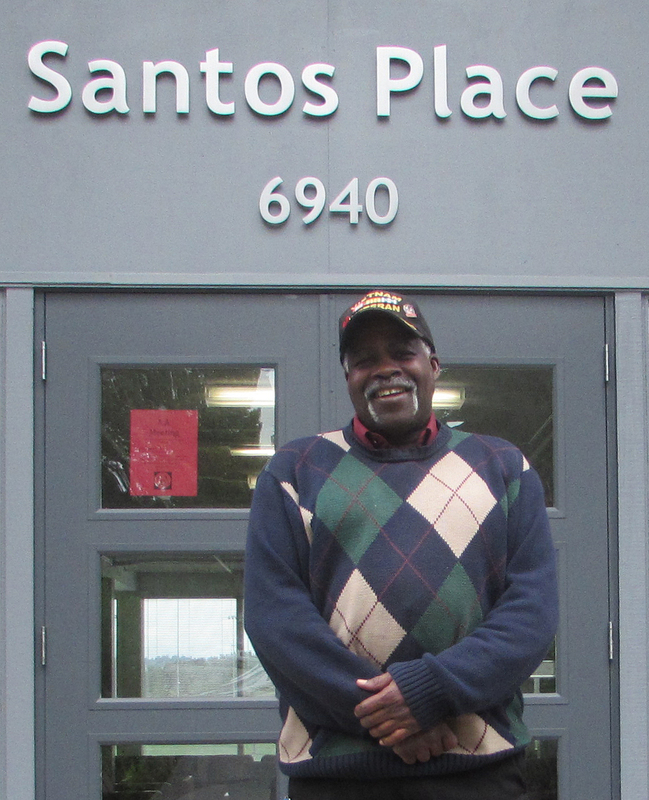 Truck driver Bruce Perry is a veteran and a resident at Santos Place on Solid Ground’s Sand Point Housing campus. He has lived in many different places – from the deep south, to California, to the Pacific Northwest – and he has worn many different career hats. From a young age, he has known exactly what he wanted to do with his life – several different things, to be exact – and one by one, he has achieved those goals. 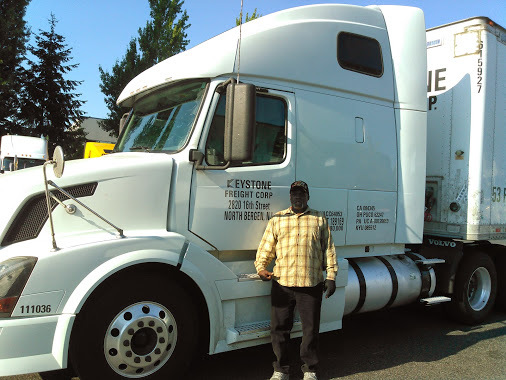 During his stay, he says, “I kept myself busy.” So while living at Santos and waiting out his suspension, he worked at Whole Foods Market and received job training through AARP – and just as soon as his suspension was up, he went straight back and got recertified as a truck driver. In June 2014, he was back on the road, and he couldn’t be happier. He drives up and down the coast, from Kent, WA to southern California and back, with weekends at home. And come December 1st, five days before his birthday, Bruce will finally move out of Santos Place and into permanent housing.